As the cycleway programme springs into full bloom, more people are getting out on their bikes and exploring new parts of the city (at least, new by bike). So how do you know what the ever-changing cycle network looks like where you’re going? Fortunately Transport for Christchurch (TfC) are maintaining a great online map that shows you all the cycle facilities (on-road and off-road) around the city. 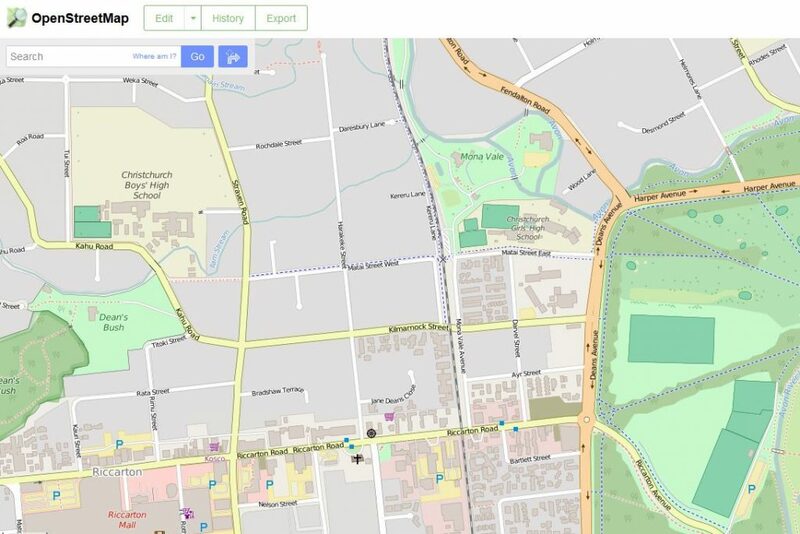 What might not be known is that the TfC cycle map is based directly on the data from OpenStreetMap (OSM), an open-source online mapping dataset. We previously told you about the ability for anyone to update Google Maps cycleway information; the same principle applies with OSM. If you’re not keen on supplying free data to a mega-corporation like Google, then you might prefer to contribute to OSM instead. And any changes made to the OSM map will show up promptly on the TfC online maps (not just the cycling one). To edit OSM data, first you need to sign up as an editor; all you need is an email address, username and password. Then you can get right into editing map data right in your web browser. The OSM editor is quite straightforward (and the online help is useful too); certainly it felt easier and more intuitive to create/edit map elements here than on Google MapMaker. OSM is based on a collection of points, lines and areas. When you select or create an item in OSM (highlighted in red) a series of attributes for that item are displayed on the lefthand side. Many of them have pre-defined options that you can select with drop-down boxes. Some quick hints: use the tick at the top to update the attributes, use the Undo button if you muck something up, and make sure you regularly use the Save button (your changes won’t be published until then). It’s taken a bit of experimenting with OSM for me to determine how it influences the TfC cycleway network. For roads, it’s fairly straightforward. You can specify “bike lanes” on each side; these could be conventional on-road lanes, off-road cycle-tracks, shared bus-lanes, even contra-flow cycleways. 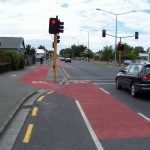 “Cycle Path” is one of the path types available for facilities away from roads. You can even specify attributes like the surfacing type, lighting and path width, or whether it’s a structure like a bridge or tunnel. Ordinary footpaths can also have bicycle access allowed too (for example, many of the city’s alleyways provide handy cycling shortcuts too); then they will also show up as off-road cycleways. Mountain-biking tracks (or other rough cycle paths) are a bit trickier to define. The key seems to be to give them a Mountain Biking Difficulty rating. There are definitely still a lot of gaps in the network around the Port Hills that could do with some tidying up. Having played with the Christchurch data, I’ve tidied up quite a few gaps in the cycling network, but there are still plenty of little tweaks needed. So any other keen bods are welcome to update further parts of the map (if any out-of-towners are wondering; no, the TfC map only shows cycle facilities in the Greater Christchurch region). One notable difference to Google Maps is that any changes to the OSM map base don’t require a couple of other people to review and approve it first – it will instantly appear online. That is of course a double-edged sword, so be sure of any changes that you make. There are some additional features that would be nice to see in the TfC cycle network map. For starters, there is currently no way to show a “cycle-friendly route” with no specific cycle facilities (e.g. like neighbourhood greenways); there are plenty of those around the city that would be useful to highlight. Also it would be good to show useful cycle-specific facilities like bike shops and bike parking; many of these are already recorded in OSM, so it’s just a matter of including this information in the TfC map. Some discussions are planned with a few key people at TfC in a couple of weeks’ time to discuss future developments, and hopefully we will see some of these things soon. 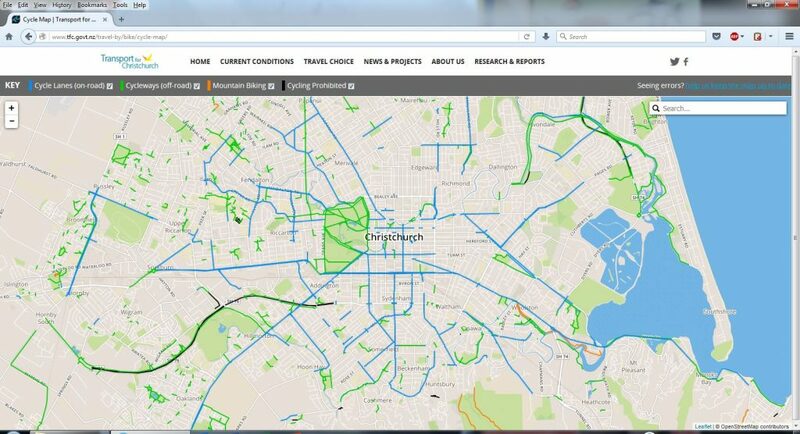 Have you tried adding/updating any cycleway data in Chch on Open Streets Map? Actually, an off-road cycletrack should be noted as a ‘track’ not a ‘lane’. Alternatively you can create a separate cycleway for it. Great resource. An obvious omission is the Lincoln-Motokurara-Little River Rail Trail. Thanks for this info. I’ve made several amendments now. Last I saw, Council libraries and service centres had some copies of the 2015 map produced, and maybe also the Chch i-Site. And they were free!